Malondo Stones are golden crystals used by the Altmer and usually only found on the Summerset Isles. The stones are pieces of cut and enchanted Meteoric Glass, a rare form of Aetherial Fragment. Alongside Culanda Stones, they are an attempt at creating magical crystals similar to the Welkynd Stones and Varla Stones produced by the Ayleids. Unlike the Ayleid stones, which crumble to dust when harnessed by modern mages, Malondo Stones can be recharged and can be tapped by spellcasters as a source of magicka replenishment or to restore charge to enchanted items. Some scholars insist that the Malondo Stone improves upon Ayleid methods and can be cultivated like the Welkynd Stones once were, although others believe the Altmer simply discovered a more reliable method of recharging the original Ayleid stones. Meteoric Glass is a variety of Aetherial Fragment. Compared to the more common meteoric iron, it rarely falls to Nirn. The glass is crystalline and comes in various colors. It is prized for being magical in nature and highly enchantable. The Ayleids, known for harnessing Aetherial Fragments, used the glass to create artifacts like Welkynd Stones and Varla Stones. The crystals were also used as a source of light in Ayleid settlements, likely due to their abhorrence of fire, which they saw as an impure and primal form of light. Skyshards were believed to be shards of Aetherial magicka that carry the essence of Nirn. They are sometimes linked to Lorkhan or Anu. When properly cultivated, meteoric glass crystals are able to grow and multiply. The Ayleids were only beginning to cultivate the material when they were wiped out by the Alessian Slave Rebellion. 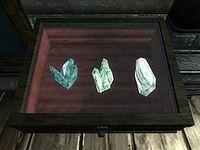 Naturally occurring meteoric glass is a common sight in Ayleid ruins, and can often be seen growing on the crumbling limestone walls of these underground structures. Enchanted pieces of meteoric glass, such as Welkynd Stones, can grow in the same way. Stormhold Crystals and the seven Star Teeth are similar in nature to meteoric glass, but it is unknown if they are made of the material. The origins of the Jewel of Fire also suggest a link to the glass. Meteoric Iron is a variety of Aetherial Fragment. It is the most common fragment to fall to Nirn. All known samples of the metal are a rusty brown in color. It is prized by armorers and enchanters for its properties in the forging of enchanted weapons and armors. The Ayleids, known for harnessing Aetherial Fragments, incorporated the metal into their architecture. As such, it is a common sight in Ayleid ruins. Meteoric Iron is the primary component of Ayleid Wells, enchanted artifacts found dotted throughout Cyrodiil. The wells are often located in the wilderness, far away from known Ayleid settlements, although they can sometimes be found outside Ayleid ruins. It is presumed that they harvest magical power from starlight. It is also suggested, without evidence or support, that they are located at the meeting points of ancient lines of magical power; however, modern arcane arts have discovered no perceptible evidence of such lines of power. Charged wells radiate magical power back into the sky. Some scholars theorize that they are of religious or ritualistic significance, perhaps a means of offering magic back to the heavens. Those with magical talents can draw magicka from the wells to restore and buff their own reserves of power. No ritual or arcane knowledge is necessary, suggesting that the wells were designed to serve unskilled magic users. Drained wells replenish their magicka at midnight. According to legend, the Chim-el Adabal formed from the blood of Lorkhan within such a well. Skyshards and Sky Prisms are a rare type of meteoric glass. Sometimes called "Shards of Aetherius", skyshards are shards of Aetherial magicka that carry the essence of Nirn. They are sometimes linked to Lorkhan or Anu. Like other aetherial fragments, Sky Prisms fall to Nirn from Aetherius through the stars, although only during specific lunar alignments. As they fall, the Prisms can be seen splitting into three shards. If three skyshards are subsequently brought together, they reform into a silvery prism and confer the magical energy to any nearby being. As well as allowing mortals to become more powerful through the creation of prisms, absorbing the power of even a single skyshard allows a Soul Shriven to be re-attuned to Anuic magic and thus return to Nirn from Oblivion. Although usually found outdoors, skyshards are often discovered and brought underground by hoarders. The Ayleids were known to harness skyshards in some way. They can also be summoned through ritual, even in Oblivion. Coldharbour has a significant number of inexplicable fallen skyshards. Space Cores, also known as Space Spheres or Spheriphem, are moonstone constructs native to the space above Nirn. Similar to Aetherial Fragments, Space Cores occasionally fall to Tamriel, although the experience is apparently unsettling for them. They will therefore attempt to cajole passing adventurers into helping them return to the void. They are seemingly sentient and possess a single eye. Space Cores can be used in Conjuration rituals. This page was last modified on 29 July 2017, at 02:46.